With a total of 48 prints on Alu-Dibond, this project represents a best of about 10 years of weather photography. The oldest picture is from 17.08.2009 – a lightning thunderstorm in the south of Jena. Over time, various tours through Germany and two trips to Tornado Alley in the USA were added. The pictures show the aesthetics of weather and atmospheric phenomena, each with appealing landscape elements, such as landmarks. My thanks for the support of this project go especially to: my family, my business partner Nico Stengert, the University Hospital Jena (above all Tine Drefahl, Rene Gumpert and Steffen Hoennicke), the professional lab Ina Peyer, interior designer Sufryd, Del Corazon Jena, DJ Engoyn, Josefa Hauch, Markus Schmidt aka Siomotion, Anke Drewitz, Dajana & Andreas Golke, Florian Brill, Patrizia Kramer, Kilian Schönberger, Dennis Oswald, Markus Weggässer, Carolin Mand, Stephan Preißler, Sebastian Reuter, Timm Schlehahn and many more. The vernissage on 16.03.2018 was a great experience with about 100 guests; especially since so many friends and acquaintances accepted the invitation. With the greeting of the organizer Tine Drefahl and my introductory slide show on worldwide weather phenomena, which can also be observed regionally, the event quickly turned into many conversations with music and snacks. While the exhibition was running, it made sense to organize different “Walk-Ins”, e.g. on 07.06. and as a finissage on 22.07. as a closing event. This proved to be a good setting to talk about the content of what had been shown, to explain the history of its origin or to answer technical questions. All pictures were then handed over to the clinic in a lottery. They are now hanging on the walls of the Cardiac and Thoracic Surgery, Clinic for Internal Medicine, Premedication Outpatient Clinic, IT and at the reception at the main entrance. 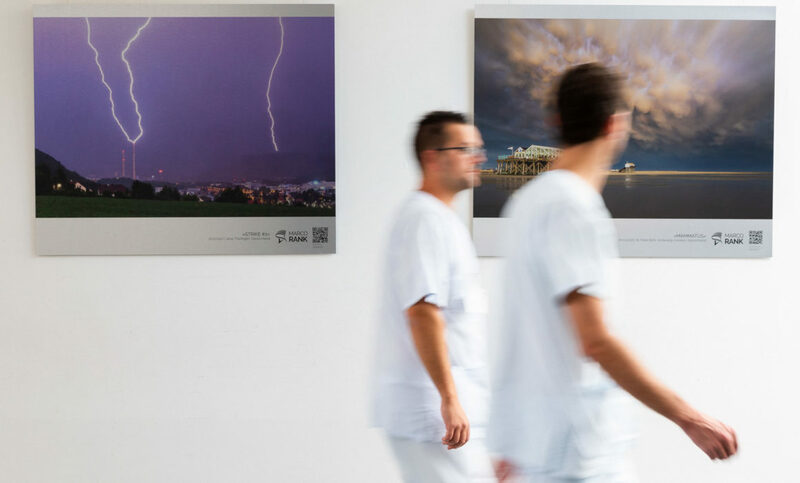 You can still visit the exhibition as a posteriori when you visit the University Hospital Jena. This can also be done online! In my gallery you will find all picture descriptions and background stories about the exhibition as well as the possibility to purchase the pictures directly. You can also call up the image descriptions on site via the QR code on your smartphone. If you would like to buy or license the exhibition pictures in an individual size, I am looking forward to your inquiry.